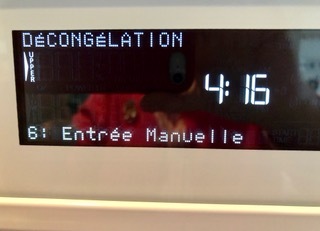 What do you do when every time you push a button on the control panel, the words on the screen are all in French? This story began when I was cooking Christmas dinner last December. We were all ready to sit down and eat. The buffet was just missing one dish—the sweet potatoes. I’d left them for last because they just needed a few minutes to cook. I put the package in the microwave, shut the door and punched in the time. Silence. Mmmmm! I tried again and then one more time. The microwave had quit. I didn’t know if it was tired since I’d been using it all morning or, because it was purchased in 1992, after 25 years it was finished. After everyone went home, my husband and I talked about getting a new microwave. We needed something that was reliable. In the past year we’d also been having problems with the oven. Sometimes it would cook. Other times it might not be in the mood. It had been installed in 1992 also. Actually, they were a wall combo and you really couldn’t replace one without replacing the other. The best time to buy appliances like these is after Christmas and during the first week in January. The reason is a number of stores in Ann Arbor have sales at this time. We quickly found out that a microwave-oven combination that has to be installed in the wall is much more expensive than just buying a microwave and an oven separately. And, you can only replace a wall combo with a wall combo. Otherwise the kitchen will look pretty strange. So, we bit the bullet and went shopping. We quickly found exactly what we wanted with the features we required at three different stores. The only difference was the price. We needed white so it would fit in with the rest of our appliances. Well, white is no longer the “in” color. So not only did we have to pay more, we had to wait. So, it wasn’t until the end of February that the microwave-oven combo arrived at the store. On Thursday, February 22, the installer came out and installed the new combo and took away the old one. Everything went smoothly. After he left, I got out the instructions with the intension of learning how to use the different features on both ovens. This is where the fun began. No matter what I punched in, the words that appeared on the screen were all in French. The first few times I used the iTranslate app to try to figure out what the screen was telling me to do. Then I realized that this was taking too much time. How was I going to cook a meal or reheat something? I decided the best thing was to call Kitchen Aid, register the combo, and ask how to get the screen to speak English. I called the number on the registration card and waited and waited and… You get the idea. After about 20 minutes a woman came on the line. She told me this was the number to register a product in French Canada. French Canada? I was in Ann Arbor, Michigan. She gave me the number to call for the United States. I did and put my iTranslate app away for another time. Thanks Barbara! You made my day. Claire, your blog is laugh-out-loud funny. I just wish problems with my printer could be solved by the tech people as easily as your problem was solved. Happy microwaving.